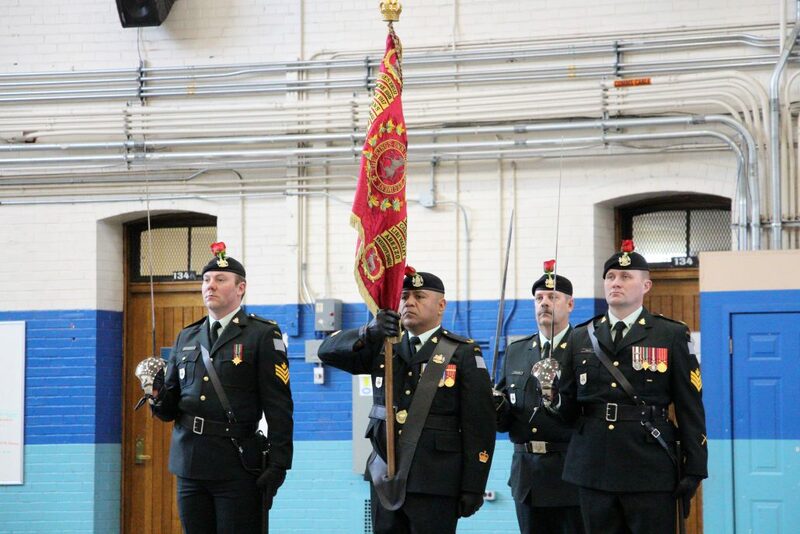 The St. George’s Day Regimental Parade was a successful event. 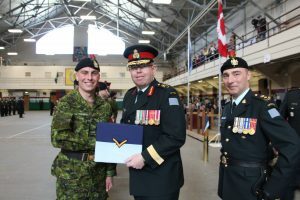 Special thanks to those family, friends, King’s Own Calgary Association members, and Armoured Cadet Corps who attended the parade and the Change of Appointment for Regimental Sergeant Major. 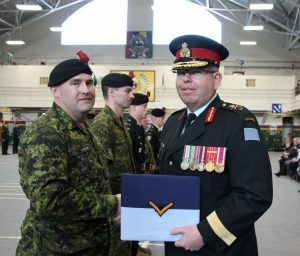 Notable Guests and Attendees included the reviewing officer, Brigadier-General Nic Stanton CD; 3rd Division Deputy Commander, Lois Mitchell; Lieutenant Governor of Alberta, Douglas Mitchell; Honourary Colonel of the King’s Own Calgary Regiment, Colonel Eppo van Weelderen; 41 Canadian Brigade Group Commander, and Chief Warrant Officer Brian Talty; 41 Canadian Brigade Sergeant Major. The Tactical Armoured Patrol vehicle was unveiled to the public and many attendees of the regimental parade had the chance to tour through the new vehicle prior to the commencement of the parade. 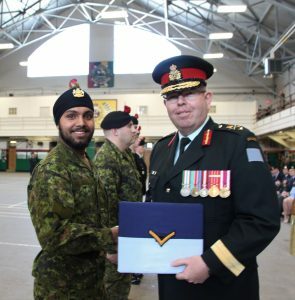 The St. George’s Day Parade was host for the graduation of The King’s Own Calgary Regiment’s Basic Armoured Crew Member Course. Since September 2017, the 14 new Troopers have learned how to operate machine-guns, use radios, drive reconnaissance vehicles, and employ reconnaissance tactics in combat situations. 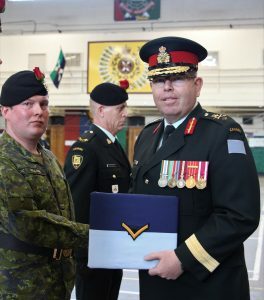 They trained on Wednesday nights and weekends over the last several months and are now qualified to move on to more advanced driver and gunner courses, including on the Regiment’s new Tactical Armoured Patrol Vehicles. 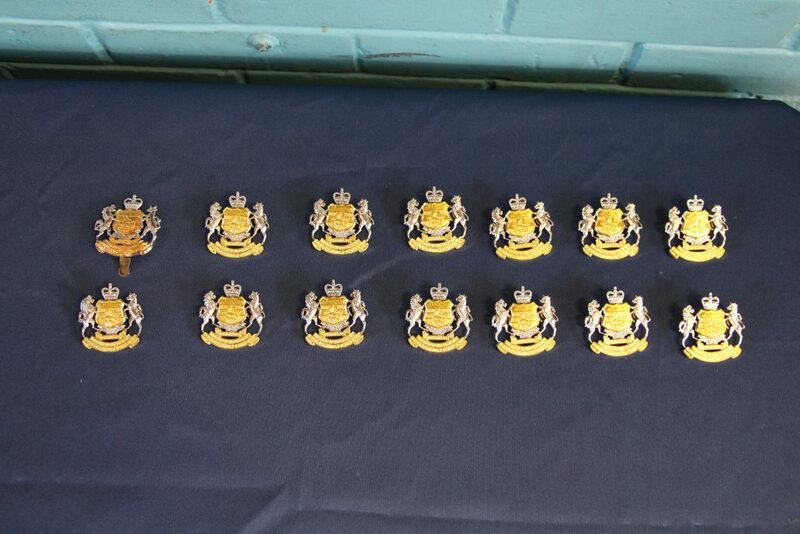 The 14 successful graduates received their coveted King’s Own Calgary Cap Badge and received their Trooper Ranks to denote the passing of their Trade’s Training. The successful graduates were Trooper (Tpr) Albano, Tpr Balazon, Tpr Belanger-Smith, Tpr Clayards, Tpr Colabella, Tpr Dewar, Tpr Dynna, Tpr Ellis-Worden, Tpr Lawlor, Tpr Lysak, Tpr Murphy, Tpr Multani, and Tpr Nielsen, and Tpr Williams. Tpr Colabella was also awarded Top Candidate on the Course. 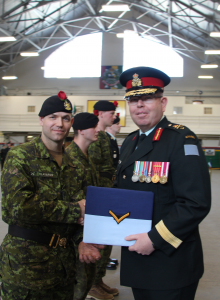 The change of appointment for Regimental Sergeant Major occurred as well. 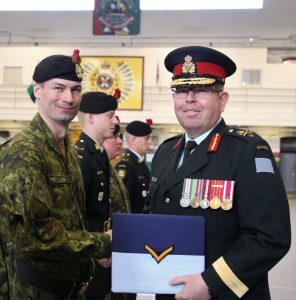 Chief Warrant Officer Cruickshank CD, after over 4 years of exemplary and hard work has now transferred his appointment to Master Warrant Officer MacGillivray. 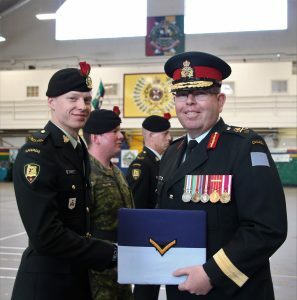 You can read up on MWO MacGillivray’s bio on the Leadership page on the King’s Own website. 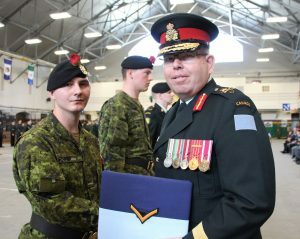 The outgoing Regimental Sergeant Major, Chief Warrant Officer Cruickshank CD, joined 903 BC Dragoon Army Cadets in 1979. He remained in cadets until 1983 achieving Master Cadet. A highlight of this time was to be selected to attend an exchange at the British Army School of Piping, Edinburgh. On return from Scotland in March 1983 he enrolled in the BC Dragoons. Basic Training courses and the initial Reconnaissance crewman was completed that year. In August 1984 he deployed to Germany with the Royal Canadian Dragoons for Fallex. He was employed as a 5 Ton driver in Regimental A2 Echelon. On return from Germany he completed the Recce Crew Commander Course. 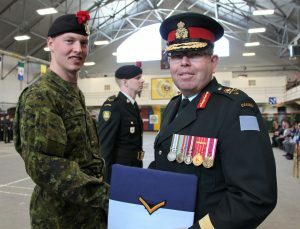 In January 1985 he went to CTC Armoured School in Gagetown as a driver in Training Support Sqn. June 1985 he was Top Candidate Cougar Gunner at NRQS Wainwright and then Top Candidate Junior NCO Course at ARTS Nanaimo. 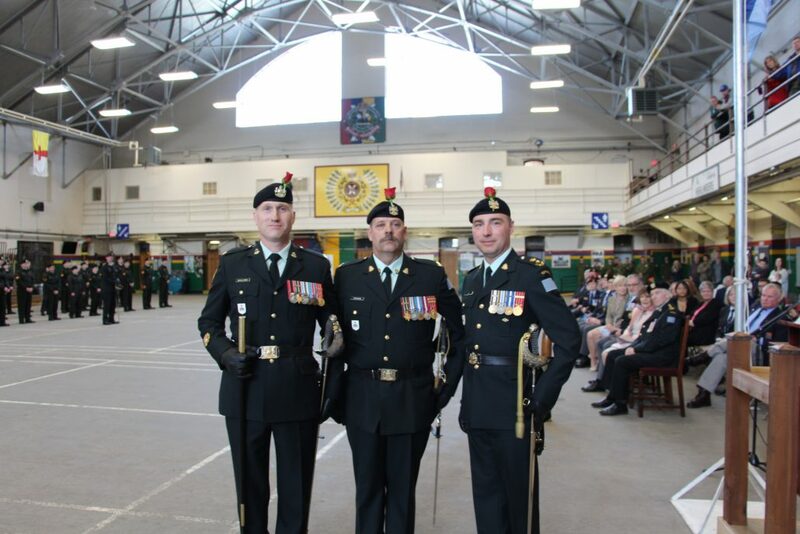 In fall 1985 CWO Cruickshank transferred to A Squadron, The King’s Own Calgary Regiment. In spring 1986 he went on the first of 3 attached postings to District / CBG Battle School and promoted to Master Corporal. In 1988 he completed Recce Patrol Commanders Course at NRQS Wainwright. He then deployed to Cyprus with Lord Strathcona’s Horse (RC) as a Section Second in Command in Rural Sqn. On return he was Top Candidate 6A Cougar Crew Commander NRQS Wainwright and promoted Sergeant. Fall 1990 he transferred back to BC Dragoons to attend Okanagan University. 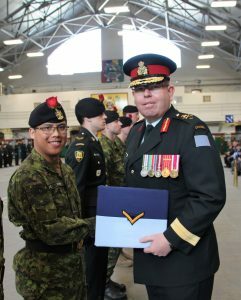 During this period he completed AFV (Cougar) Coach course and was Top Candidate 6B Armour, both at CTC Armoured School. 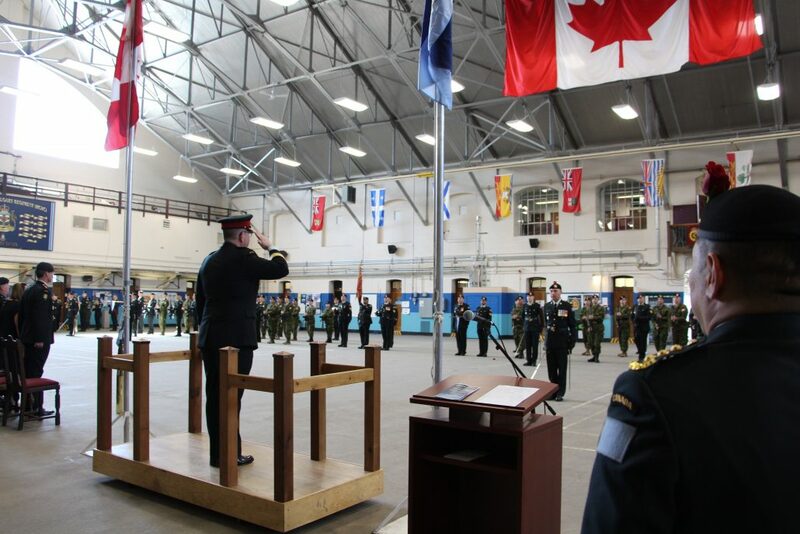 He spent Jun 1994-Jun 1995 at the RCA Battle School, Shilo MB conducting recruit training. During this time he was also a piper in 1 RCHA Pipe Band. In 1995 CWO Cruickshank and returned to the Kings Own. 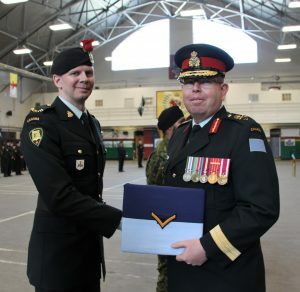 He attended Senior Leaders Course in Shilo and was promoted Warrant Officer in December 1995. 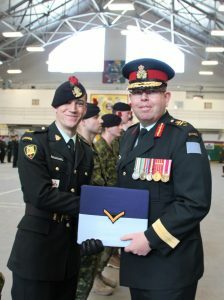 He attended DP4 Armoured SSM course in 1998 at CTC Armoured School. In 1998 he became Ops Warrant Officer, 41 CBG Battle School and also became Vice President of the Mess Committee of the Mewata WO’s & Sgt’s Mess and became President until 2002. 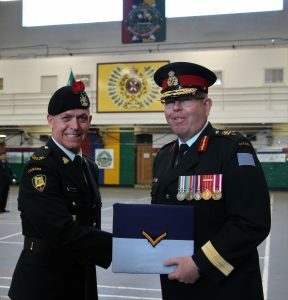 In 2002 he became the Area Reserve Standards WO Calgary until 2007. In May 2007 he began pre-deployment training and eventually deployed in January 2008 to Afghanistan as CQMS All Source Intelligence Centre. 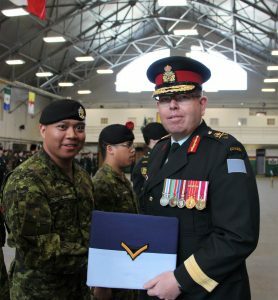 On return in October 2008 he was employed at 41 CBG HQ as G3 Tasks 2. He remained in this position until 2010 where on promotion to MWO he moved to G4 Branch as G4 Transport 2 until Nov 2011. In 2009 he also resumed parading with the Kings Own as Squadron Sergeant Major A Sqn. He was appointed RSM of The Kings Own on St Georges Day 2013, and was promoted CWO in October 2013.